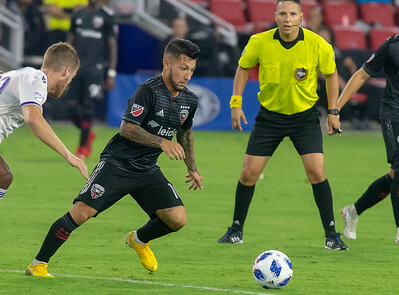 Washington, DC, Sunday, August 12, 2018: Luciano Acosta (10) of D.C. United scored all three of the D.C. United goals in it's 3-2 win during a Major League Soccer match held at the Audi Field in Washington, DC. (Michael R. Smith/The Prince George's Sentinel). 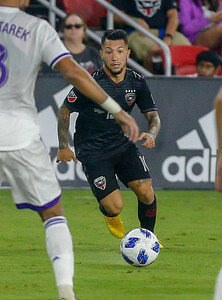 Washington, DC, Sunday, August 12, 2018: Luciano Acosta (10) of D.C. United during a Major League Soccer match held at the Audi Field in Washington, DC. (Michael R. Smith/The Prince George's Sentinel). Washington, DC, Sunday, August 12, 2018: Paul Arriola (7) of D.C. United heads the ball away from Chris Mueller (17) of Orlando City during a Major League Soccer match held at the Audi Field in Washington, DC. (Michael R. Smith/The Prince George's Sentinel). 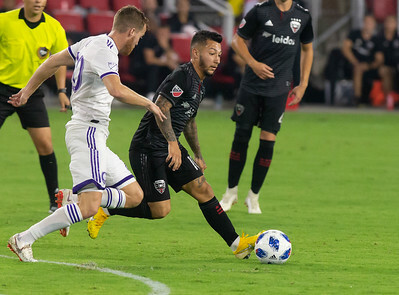 Washington, DC, Sunday, August 12, 2018: Luciano Acosta (10) of D.C. United scored three goals against Orlando City SC during a Major League Soccer match held at the Audi Field in Washington, DC. (Michael R. Smith/The Prince George's Sentinel). Washington, DC, Sunday, August 12, 2018: Joseph Mora (28) of D.C. United during a Major League Soccer match held at the Audi Field in Washington, DC. (Michael R. Smith/The Prince George's Sentinel). 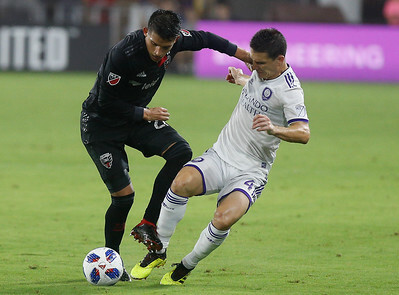 Washington, DC, Sunday, August 12, 2018: Joseph Mora (28) of D.C. United and Will Johnson (4) of Orlando City SC fight for possession during a Major League Soccer match held at the Audi Field in Washington, DC. (Michael R. Smith/The Prince George's Sentinel). 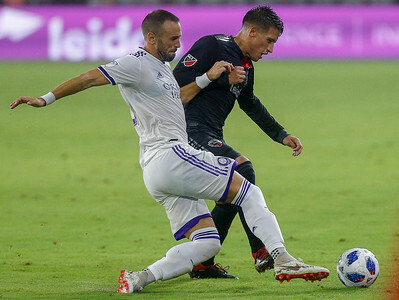 Washington, DC, Sunday, August 12, 2018: Scott Sutter (21) of Orlando City SC and Yamil Asad (22) of D.C. United battle for the ball during a Major League Soccer match held at the Audi Field in Washington, DC. (Michael R. Smith/The Prince George's Sentinel). Washington, DC, Sunday, August 12, 2018: Zoltan Stieber's (18) shot is knocked away by goalkeeper Joseph Bendik (1) of Orlando City during a Major League Soccer match held at the Audi Field in Washington, DC. (Michael R. Smith/The Prince George's Sentinel). 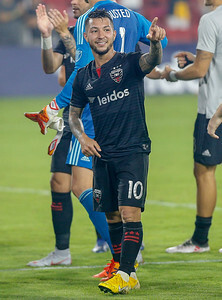 Washington, DC, Sunday, August 12, 2018: Luciano Acosta (10) of D.C. United acknowledges the United fans after the 3-2 win over Orlando City SC during a Major League Soccer match held at the Audi Field in Washington, DC. (Michael R. Smith/The Prince George's Sentinel).